What is his naturalization of meaning? Or morality? Or cognition—especially cognition! How does one assess the cognitive revolution that is the Enlightenment short understanding the nature of cognition? How does one prognosticate something one does not scientifically understand? At one point he offers that “[t]he principles of information, computation, and control bridge the chasm between the physical world of cause and effect and the mental world of knowledge, intelligence, and purpose” (22). Granted, he’s a psychologist: operationalizations of information, computation, and control are his empirical bread and butter. But operationalizing intentional concepts in experimental contexts is a far cry from naturalizing intentional concepts. He entirely neglects to mention that his ‘bridge’ is merely a pragmatic, institutional one, that cognitive science remains, despite decades of research and billions of dollars in resources, unable to formulate its explananda, let alone explain them. He mentions a great number of philosophers, but he fails to mention what the presence of those philosophers in his thetic wheelhouse means. All he ultimately has, on the one hand, is a kind of ‘ta-da’ argument, the exhaustive statistical inventory of the bounty of reason, science, and humanism, and on the other hand (which he largely keeps hidden behind his back), he has the ‘tu quoque,’ the question-begging presumption that one can only argue against reason (as it is traditionally understood) by presupposing reason (as it is traditionally understood). “We don’t believe in reason,” he writes, “we use reason” (352). Pending any scientific verdict on the nature of ‘reason,’ however, these kinds of transcendental arguments amount to little more than fancy foot-stomping. Although it’s true that Nietzsche (like Pinker) lacked any scientifically compelling theory of cognition, what he did understand was its relation to power, the fact that “when you face an adversary alone, your best weapon may be an ax, but when you face an adversary in front of a throng of bystanders, your best weapon may be an argument” (415). To argue that all knowledge is contextual isn’t to argue that all knowledge is fundamentally equal (and therefore not knowledge at all), only that it is bound to its time and place, a creature possessing its own ecology, its own conditions of failure and flourishing. The Nietzschean thought experiment is actually quite a simple one: What happens when we turn Enlightenment skepticism loose upon Enlightenment values? For Nietzsche, Enlightenment Now, though it regularly pays lip service to the ramshackle, reversal-prone nature of progress, serves to conceal the empirical fact of cognitive ecology, that we remain, for all our enlightened noise-making to the contrary, animals bent on minimizing discrepancies. The Enlightenment only survives its own skepticism, Nietzsche thought, in the transvaluation of value, which he conceived—unfortunately—in atavistic or morally regressive terms. This underwrites the subsequent critique of the Enlightenment we find in Adorno—another thinker whom Pinker grossly underestimates. Though science is able to determine the more—to provide more food, shelter, security, etc.—it has the social consequence underdetermining (and so undermining) the better, stranding civilization with a nihilistic consumerism, where ‘meaningfulness’ becomes just another commodity, which is to say, nothing meaningful at all. Adorno’s whole diagnosis turns on the way science monopolizes rationality, the way it renders moral discourses like Pinker’s mere conjectural exercises (regarding the value of certain values), turning on leaps of faith (on the nature of cognition, etc. ), bound to dissolve into disputation. Although both Nietzsche and Adorno believed science needed to be understood as a living, high dimensional entity, neither harboured any delusions as to where they stood in the cognitive pecking order. Unlike Pinker. Time and again Pinker likens the process of Enlightenment, the movement away from our tutelary natures, in terms of a conflict between ancestral cognitive predilections and scientifically and culturally revolutionized environments. “Humans today,” he writes, “rely on cognitive faculties that worked well enough in traditional societies, but which we now see are infested with bugs” (25). And the number of bugs that Pinker references in the course of the book is nothing short of prodigious. We tend to estimate frequencies according to ease of retrieval. We tend to fear losses more than we hope for gains. We tend to believe as our group believes. We’re prone to tribalism. We tend to forget past misfortune, and to succumb to nostalgia. The list goes on and on. We are the products of ancestral cognitive ecologies, yes, but our capacity for optimizing our capacities allows us to overcome our ‘flawed natures,’ become something better than what we were. “The challenge for us today,” Pinker writes, “is to design an informational environment in which that ability prevails over the ones that lead us into folly” (355). And here we encounter the paradox that Enlightenment Now never considers, even though Pinker presupposes it continually. The challenge for us today is to construct an informational environment that mitigates the problems arising out of our previous environmental constructions. The ‘bugs’ in human nature that need to be fixed were once ancestral features. What has rendered these adaptations ‘buggy’ is nothing other than the ‘march of progress.’ A central premise of Enlightenment Now is that human cognitive ecology, the complex formed by our capacities and our environments, has fallen out of whack in this way or that, cuing us to apply atavistic modes of problem-solving out of school. The paradox is that the very bugs Pinker thinks only the Enlightenment can solve are the very bugs the Enlightenment has created. What Nietzsche and Adorno glimpsed, each in their own murky way, was a recursive flaw in Enlightenment logic, the way the rationalization of everything meant the rationalization of rationalization, and how this has to short-circuit human meaning. Both saw the problem in the implementation, in the physiology of thought and community, not in the abstract. So where Pinker seeks to “to restate the ideals of the Enlightenment in the language and concepts of the 21st century” (5), we can likewise restate Nietzsche and Adorno’s critiques of the Enlightenment in Pinker’s own biological idiom. The problem with the Enlightenment is a cognitive ecological problem. The technical (rational and technological) remediation of our cognitive ecologies transforms those ecologies, generating the need for further technical remediation. Our technical cognitive ecologies are thus drifting ever further from our ancestral cognitive ecologies. Human sociocognition and metacognition in particular are radically heuristic, and as such dependent on countless environmental invariants. Before even considering more, smarter intervention as a solution to the ambient consequences of prior interventions, the big question has to be how far—and how fast—can humanity go? At what point (or what velocity) does a recognizably human cognitive ecology cease to exist? This question has nothing to do with nostalgia or declinism, no more than any question of ecological viability in times of environmental transformation. It also clearly follows from Pinker’s own empirical commitments. The formula is simple. Enlightenment reason solves natures, allowing the development of technology, generally relieving humanity of countless ancestral afflictions. But Enlightenment reason is only now solving its own nature. Pinker, in the absence of that solution, is arguing that the formula remains reliable if not quite as simple. And if all things were equal, his optimistic induction would carry the day—at least for me. As it stands, I’m with Nietzsche and Adorno. All things are not equal… and we would see this clearly, I think, were it not for the intentional obscurities comprising humanism. Far from the latest, greatest hope that Pinker makes it out to be, I fear humanism constitutes yet another nexus of traditional intuitions that must be overcome. The last stand of ancestral authority. I agree this conclusion is catastrophic, “the greatest intellectual collapse in the history of our species” (vii), as an old polemical foe of Pinker’s, Jerry Fodor (1987) calls it. Nevertheless, short grasping this conclusion, I fear we court a disaster far greater still. Hitherto, the light cast by the Enlightenment left us largely in the dark, guessing at the lay of interior shadows. We can mathematically model the first instants of creation, and yet we remain thoroughly baffled by our ability to do so. So far, the march of moral progress has turned on the revolutionizing our material environments: we need only renovate our self-understanding enough to accommodate this revolution. Humanism can be seen as the ‘good enough’ product of this renovation, a retooling of folk vocabularies and folk reports to accommodate the radical environmental and interpersonal transformations occurring around them. The discourses are myriad, the definitions are endlessly disputed, nevertheless humanism provisioned us with the cognitive flexibility required to flourish in an age of environmental disenchantment and transformation. Once we understand the pertinent facts of human cognitive ecology, its status as an ad hoc ‘tutelary nature’ becomes plain. Just what are these pertinent facts? First, there is a profound distinction between natural or causal cognition, and intentional cognition. Developmental research shows that infants begin exhibiting distinct physical versus psychological cognitive capacities within the first year of life. Research into Asperger Syndrome (Baron-Cohen et al 2001) and Autism Spectrum Disorder (Binnie and Williams 2003) consistently reveals a cleavage between intuitive social cognitive capacities, ‘theory-of-mind’ or ‘folk psychology,’ and intuitive mechanical cognitive capacities, or ‘folk physics.’ Intuitive social cognitive capacities demonstrate significant heritability (Ebstein et al 2010, Scourfield et al 1999) in twin and family studies. Adults suffering Williams Syndrome (a genetic developmental disorder affecting spatial cognition) demonstrate profound impairments on intuitive physics tasks, but not intuitive psychology tasks (Kamps et al 2017). The distinction between intentional and natural cognition, in other words, is not merely a philosophical assertion, but a matter of established scientific fact. Second, cognitive systems are mechanically intractable. From the standpoint of cognition, the most significant property of cognitive systems is their astronomical complexity: to solve for cognitive systems is to solve for what are perhaps the most complicated systems in the known universe. The industrial scale of the cognitive sciences provides dramatic evidence of this complexity: the scientific investigation of the human brain arguably constitutes the most massive cognitive endeavor in human history. (In the past six fiscal years, from 2012 to 2017, the National Institute of Health [21/01/2017] alone will have spent more than 113 billion dollars funding research bent on solving some corner of the human soul. This includes, in addition to the neurosciences proper, research into Basic Behavioral and Social Science (8.597 billion), Behavioral and Social Science (22.515 billion), Brain Disorders (23.702 billion), Mental Health (13.699 billion), and Neurodegeneration (10.183 billion)). Despite this intractability, however, our cognitive systems solve for cognitive systems all the time. And they do so, moreover, expending imperceptible resources and absent any access to the astronomical complexities responsible—which is to say, given very little information. Which delivers us to our third pertinent fact: the capacity of cognitive systems to solve for cognitive systems is radically heuristic. It consists of ‘fast and frugal’ tools, not so much sacrificing accuracy as applicability in problem-solving (Todd and Gigerenzer 2012). When one cognitive system solves for another it relies on available cues, granular information made available via behaviour, utterly neglecting the biomechanical information that is the stock and trade of the cognitive sciences. This radically limits their domain of applicability. The heuristic nature of intentional cognition is evidenced by the ease with which it is cued. Thus, the fourth pertinent fact: intentional cognition is hypersensitive. Anthropomorphism, the attribution of human cognitive characteristics to systems possessing none, evidences the promiscuous application of human intentional cognition to intentional cues, our tendency to run afoul what might be called intentional pareidolia, the disposition to cognize minds where no minds exist (Waytz et al 2014). The Heider-Simmel illusion, an animation consisting of no more than shapes moving about a screen, dramatically evidences this hypersensitivity, insofar as viewers invariably see versions of a romantic drama (Heider and Simmel 1944). Research in Human-Computer Interaction continues to explore this hypersensitivity in a wide variety of contexts involving artificial systems (Nass and Moon 2000, Appel et al 2012). The identification and exploitation of our intentional reflexes has become a massive commercial research project (so-called ‘affective computing’) in its own right (Yonck 2017). Intentional pareidolia underscores the fact that intentional cognition, as heuristic, is geared to solve a specific range of problems. In this sense, it closely parallels facial pareidolia, the tendency to cognize faces where no faces exist. Intentional cognition, in other words, is both domain-specific, and readily misapplied. The incompatibility between intentional and mechanical cognitive systems, then, is precisely what we should expect, given the radically heuristic nature of the former. Humanity evolved in shallow cognitive ecologies, mechanically inscrutable environments. Only the most immediate and granular causes could be cognized, so we evolved a plethora of ways to do without deep environmental information, to isolate saliencies correlated with various outcomes (much as machine learning). Human intentional cognition neglects the intractable task of cognizing natural facts, leaping to conclusions on the basis of whatever information it can scrounge. In this sense it’s constantly gambling that certain invariant backgrounds obtain, or conversely, that what it sees is all that matters. This is just another way to say that intentional cognition is ecological, which in turn is just another way to say that it can degrade, even collapse, given the loss of certain background invariants. 1) Intentional cognition depends on cognitive ecological invariances. 2) Scientific progress entails the continual transformation of cognitive ecological invariances. Thus, 3) scientific progress entails the collapse of intentional cognition. But this argument oversimplifies matters. To see as much one need only consider the way a semantic apocalypse—the collapse of intentional cognition—differs from say a nuclear or zombie apocalypse. The Walking Dead, for instance, abounds with savvy applications of intentional cognition. The physical systems underwriting meaning, in other words, are not the same as the physical systems underwriting modern civilization. So long as some few of us linger, meaning lingers. Intentional cognition, you might think, is only as weak or as hardy as we are. No matter what the apocalyptic scenario, if humans survive it survives. But as autistic spectrum disorder demonstrates, this is plainly not the case. Intentional cognition possesses profound constitutive dependencies (as those suffering the misfortune of watching a loved one succumb to strokes or neurodegenerative disease knows first-hand). Research into the psychological effects of solitary confinement, on the other hand, show that intentional cognition also possesses profound environmental dependencies as well. Starve the brain of intentional cues, and it will eventually begin to invent them. The viability of intentional cognition, in other words, depends not on us, but on a particular cognitive ecology peculiar to us. The question of the threshold of a semantic apocalypse becomes the question of the stability of certain onboard biological invariances correlated to a background of certain environmental invariances. Change the constitutive or environmental invariances underwriting intentional cognition too much, and you can expect it will crash, generate more problems than solutions. The hypersensitivity of intentional cognition either evinced by solitary confinement or more generally by anthropomorphism demonstrates the threat of systematic misapplication, the mode’s dependence on cue authenticity. (Sherry Turkle’s (2007) concerns regarding ‘Darwinian buttons,’ or Deidre Barrett’s (2010) with ‘supernormal stimuli,’ touch on this issue). So, one way of inducing semantic apocalypse, we might surmise, lies in the proliferation of counterfeit cues, information that triggers intentional determinations that confound, rather than solve any problems. One way to degrade cognitive ecologies, in other words, is to populate environments with artifacts cuing intentional cognition ‘out of school,’ which is to say, circumstances cheating or crashing them. The morbidity of intentional cognition demonstrates the mode’s dependence on its own physiology. What makes this more than platitudinal is the way this physiology is attuned to the greater, enabling cognitive ecology. Since environments always vary while cognitive systems remain the same, changing the physiology of intentional cognition impacts every intentional cognitive ecology—not only for oneself, but for the rest of humanity as well. Just as our moral cognitive ecology is complicated by the existence of psychopaths, individuals possessing systematically different ways of solving social problems, the existence of ‘augmented’ moral cognizers complicates our moral cognitive ecology as well. This is important because you often find it claimed in transhumanist circles (see, for example, Buchanan 2011), that ‘enhancement,’ the technological upgrading of human cognitive capacities, is what guarantees perpetual Enlightenment. What better way to optimize our values than by reengineering the biology of valuation? Here, at last, we encounter Nietzsche’s question cloaked in 21st century garb. And here we can also see where the above argument falls short: it overlooks the inevitability of engineering intentional cognition to accommodate constitutive and environmental transformations. The dependence upon cognitive ecologies asserted in (1) is actually contingent upon the ecological transformation asserted in (2). 1) Intentional cognition depends on constitutive and environmental cognitive ecological invariances. 2) Scientific progress entails the continual transformation of constitutive and environmental cognitive ecological invariances. Thus, 3) scientific progress entails the collapse of intentional cognition short remedial constitutive transformations. The former dilemma is presently dominating the headlines and is set to be astronomically complicated by the explosion of AI. The latter we can see rising out of literature, clawing its way out of Hollywood, seizing us with video game consoles, engulfing ever more experiential bandwidth. And as I like to remind people, 100 years separates the Blu-Ray from the wax phonograph. The key to blocking the possibility that the transformative potential of (2) can ameliorate the dependency in (1) lies in underscoring the continual nature of the changes asserted in (2). A cognitive ecology where basic constitutive and environmental facts are in play is no longer recognizable as a human one. Scientific progress entails the collapse of intentional cognition. On this view, the coupling of scientific and moral progress is a temporary affair, one doomed to last only so long as cognition itself remained outside the purview of Enlightenment cognition. So long as astronomical complexity assured that the ancestral invariances underwriting cognition remained intact, the revolution of our environments could proceed apace. Our ancestral cognitive equilibria need not be overthrown. In place of materially actionable knowledge regarding ourselves, we developed ‘humanism,’ a sop for rare stipulation and ambient disputation. But now that our ancestral cognitive equilibria are being overthrown, we should expect scientific and moral progress will become decoupled. And I would argue that the evidence of this is becoming plainer with the passing of every year. Next week, we’ll take a look at several examples. I fear Donald Trump may be just the beginning. Very interesting article! I enjoyed Pinker’s book as well, although I disliked his strict dichotomy of reason versus folly. It strikes me that we are basically engineering AI to obtain a “theory of mind”. And that this is a lot simpler than scientifically understanding what consciousness is. We could even improve that artificial theory of mind to be more accurate than our own. Agreed on the engineering front. But no ‘theory of mind’ is required–for us or our machines–just a grab-bag of predictively useful tricks. Think of the Facebook algorithms that can predict your ‘likes’ better than you can: are these theories of mind, or the exploitation of cues (sparse, available information) possessing reliable correlations to certain forms of behaviour? Still finishing reading this but I think this is the blog post where you’ve made your whole project the most clear it has ever been. I had the same thought. I’m a long time reader of the blog and had started to wonder if Pinker’s latest would be engaged with. This is for me one of the best iterations of the argument/project, although perhaps especially because it targets Pinker’s Enlightenment optimism/humanism. A lot to digest here, but I’m agreeing with the analysis (while typically worrying about my own clutch of cognitive biases that are pulling me in that direction). Thank you too Paul. I’ll ask you the same question I asked Joao: what in particular did you find illuminating in this piece, and what in particular did you find obscure in my position beforehand? Thanks Joao. Is there anything specific that clinched things for you? What was it you found most difficult to understand prior? First a bit of backstory to set the stage. I started reading your books in my second year of college and by that point Ayn Rand’s philosophy was well engrained into me. I read her fiction, then her non-fiction, the non-fiction written by her associates, and I engaged in the community around it. As you can guess, I thought I had the answer to most questions, and those I didn’t I thought I could get there by following the recipes that Objectivism provided. It’s hard to say that it was your books that made me realize this whole framework I had bought wholesale into was wrong, or as wrong as every other neat and systematized philosophy was. I loved your works even before I realized this, but I don’t think at that point I quite realized what it was you were doing. You could say I was reading the superficial layer of your work while sometimes engaging with the deeper thoughts you were packing into the fantasy trappings but coming out from those engagements in the sort of cognitive dissonance that is so common to us all. As Whitman said, I contained multitudes. This all changed when I read Haidt’s The Righteous Mind. Haidt demolished any fantasies I might have had about having discovered the One True Morality, or the True Political System. If moral and political judgments are conditioned on what he called the Moral Foundations that people might have, then, based on that knowledge, I must infer that my own judgments are biased because of my own moral foundations. It’s like in religion, why does someone born into Christianity become a Christian and not a Muslim? If something as personally momentous as one’s religion is predicated on some a priori condition, something I already agreed with, then having the same argument made for how we reason about morality and how that translates into our political judgments made me realize that I could not be less bigoted than those I regarded as being wrong – now I’m just patiently waiting until those people come to realize that they too are bigots. One of the consequences from having read Haidt’s book then is that I became much more interested in this problem of how our evolutionary origin conditions our cognition, and that’s a project that I have been interested in since then and have been reading more about. This is why for the last few months I have been reading more deeply about the cognitive science of religion, a topic that comes naturally from Haidt’s book – and that as a non-believer is fascinating, another proof of what I thought was moral and intellectual superiority is just a quirk of nature and circumstance, – cultural evolution and, more recently, consciousness. That’s why I am finding it hard to pinpoint exactly what you did differently that might help you structure other pieces that you might write. I just have much more knowledge and am better able to match what you’re saying (e.g. shallow vs deep ecologies) with what I know in a way that makes *more* sense – though I wouldn’t venture to say that I *get* what you’re saying just yet. So often reading Three Pound Brain puts me in mind of the Butlerian Jihad and the Commandment ‘Thou shalt not make a machine in the image of the human mind.’ I’m also reminded of something I mentioned here once before, that the Turing test is at least as much a test of human gullibility as it is of technological progress. This is one of the big problems with humanism: the way it cements the illusion that something more than the aggregation of tricks is required. 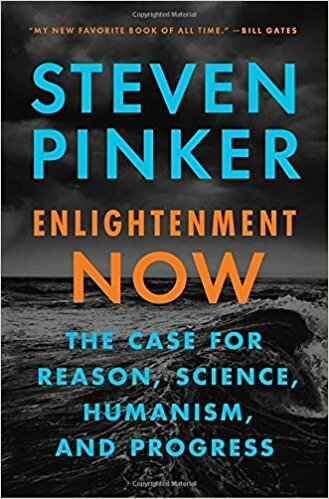 Is the title ‘Enlightenment now’ supposed to be a reference to ‘Apocalypse now’? I haven’t yet found a link to the bioreactor instructions but if I do I’ll put it here, and I’m looking forward to some horror-free cannibalism in the near future. Aww man, you’re making me feel hopes and stuffs! That sounds good! But don’t tell anyone I said that, in case someone comes and crushingly disproves it! And an embarrassing review as well! Thank you for this. It should have been entitled, “List of Knee-Jerk Responses Meant to Cue Ingroup Solidarity by Whacking Straw Dummy Wearing Pinker’s Face.” Pinker feigns a continuity between science and his ideology (a charge I’ve weathered many times myself)–this is the painfully obvious criticism. The rest is just moralizing and misreading. A call to holographic arms. “Embarrassing”? Talk about a prima facie case of projection!. John Gray’s lucidity contrasts admirably with your flatulent verbosity. As for your accusations, they are are nothing but vague and empty assertions bereft of argument. Gray hits his target squarely, and as any one who actually bothers to read his remarks will see, the target is made of flesh and bone. As for your accusations regarding my accusations, ‘they are nothing but vague and empty assertions bereft of argument.’ I love arguments. Give me one, and I’ll reply. Otherwise, kindly check your shoelaces before leaping at the starting pistol, my friend. So just to clear: what you say is that more science will make clear free will does not exist, evoking all kinds of does-not-compute responses in humans and society? ‘Free will’ is simply one kind of sociocognitive crash space. There’s many others, some of which I’ll be covering in my follow-up post next Monday. Quality. Never much else to add on my part but using Pinker’s latest as a vehicle is bound to garner hits and interaction. I was listening to NPR Morning Edition on the way to work this morning. They talked about Cambridge Analytica, the 2016 and upcoming 2018 U. S. elections and Brexit. Is what CA supposed to have accomplished with Facebook’s data different in kind than what political campaigns have always tried to do or merely different in degree? After all, what CA is supposed to have done is simply use data people have generated about themselves to target them with information (or disinformation) that confirms and amplifies their pre-existing biases. You could say CA has simply helped them to be more who they already are. To be sure, one can argue that the amplification of differences makes the compromises and consensus forming necessary for peaceful coexistence harder to achieve, but absent the sort of Butlerian Jihad I mentioned in my previous post (and this is likely the last moment in which such a war could be won by the Butlerians) we will simply have to create a new politics for an era in which consensus building is no longer possible. My understanding is that its fundamentally no different than the micro-targeting methods/tools used by Clinton, Obama, and others, it’s just has a more transgressive relationship to truth and accuracy. The new politics is being created before our eyes. The terrifying questions involve cornerstone institutions. you can in theory create a politics that gives the people what they want and discourages them from wanting anything else. You can combine Brave New World and 1984 into a soft totalitarianism that might actually be better than liberal democracy. I think the issue is normally when you show something on TV or other mass media, you show it to everyone. So everyone sees what absolute BS you’re saying if you are and they call it in the open. Here, only the people who will believe it will see it. So they become more radicalized without anyone else even noticing. Until you hold an election and realize that the self-segregation the internet has made possible has destroyed the political center of the country and now no set of policies or solutions commands sufficient consensus to be enacted and implemented. China may well have the right of it. It may be that we have created a communications technology so powerful and so inimical to the public good that private citizens and for profit corporations cannot be trusted with it. Well, government already doesn’t trust us or companies with various types of drug. Basically for the same reason – they lead to private empires which in time threaten the greater empire that is government. Don’t have to refer to China for an example of that sort of control. Political adverts here have to have a note at the end saying which party made the ad. The issue here is political media is being put out but not indicating who it is from and that is not being policed at all. Facebook and other ‘social’ platforms are rather like a distributor of illegal drugs. I guess maybe the people in powerful legal places are just way behind the times. Constitutional government is one of the enlightenment’s crowning achievements. Can it survive the decoupling of scientific and moral progress that Scott (and I) think is coming? If the voter preference manipulation technology Cambridge Analytica is accused of using is in its infancy what might it be like fifty years from now, given reasonable improvements in machine learning and psychological profiling. Can there be a ‘will of the people’ in such an environment? If elections no longer represent any such ‘will of the people’ what, if anything, will perform the function elections serve in our current politics? If similarly powerful manipulation technology is applied to advertising what will that do to the information prices are supposed to provide to economic agents? How will an economy driven entirely by the manipulable vagaries of fashion operate? Great post. Tension, as always, between the M and the L. Same M’s often lead to different L’s. I had the same problem when I was teaching 8th grade social studies. I’m planning on founding a cult based on your teachings with books titled “the magic of disenchantment” and “how to navigate crash space”. If Hubbard can do it you can do it!